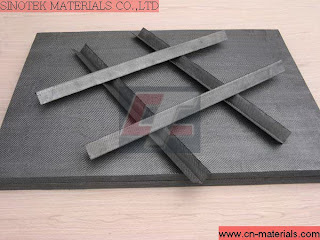 One of the most advanced and promising engineering material is the carbon fiber reinforced carbon-matrix composite, often termed a carbon–carbon composite; as the name implies, both reinforcement and matrix are carbon. These materials are relatively new and expensive and, therefore, are not currently being utilized extensively. Their desirable properties include high-tensile moduli and tensile strengths that are retained to temperatures in excess of 2000oC (3630F), resistance to creep, and relatively large fracture toughness values. Furthermore, carbon–carbon composites have low coefficients of thermal expansion and relatively high thermal conductivities; these characteristics, coupled with high strengths, give rise to a relatively low susceptibility to thermal shock. Their major drawback is a propensity to high-temperature oxidation. An example of CC composite applications is a one-piece, bladed turbine rotor that, in service, is coated to prevent oxidation. The rotor offers higher temperature performance without cooling; low weight and use of low-cost, non-strategic materials. Other gas turbine engine applications using CC composites include exhaust nozzle flaps and seals, augmenters, combustors and acoustic panels. CC material systems using coatings, TEOS and additions to the basic CC recipe have improved the oxidation resistance of products made of CC composites by an order of magnitude. These composites are being used in products such as the nozzle in the F-100 jet engine afterburner, turbine wheels operating at >40 000 rpm, non-wetting crucibles for molten metals, nose caps and leading edges for missiles and for the Space Shuttle, wind-tunnel models and racing car and commercial disk brakes.